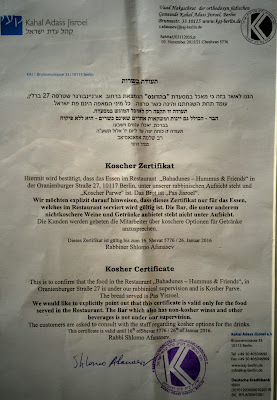 Update August 2016: The restaurant stopped to be under kosher supervision, the proprietor told me that they will get a new kosher supervision in the future. Please check yourself - Schlomo. Amidst the first snow of the season we visited Hummus and Friends, a kosher parve restaurant in Berlin Mitte. 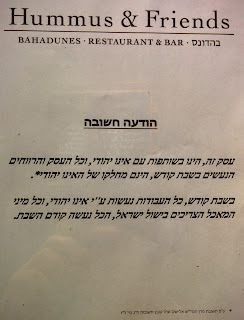 It does not advertise the fact that it is kosher but markets itself as a vegan restaurant. 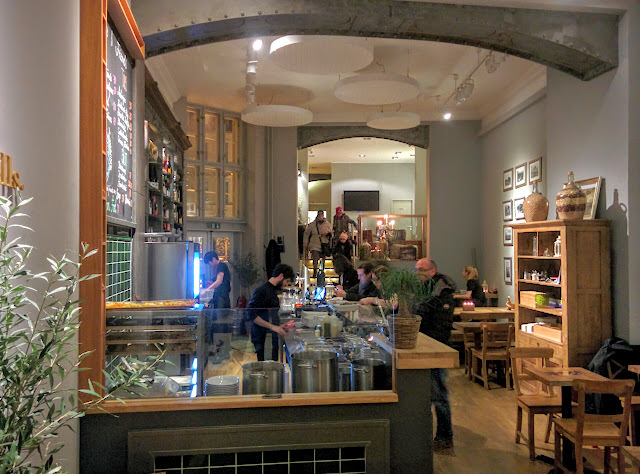 It is located on Oranienburger Straße, just next door to the museum and synagogue. The restaurant has 12 tables and seats about 70. On a Tuesday evening at 19:00 the restaurant was half full. The music was just a bit too loud for a quiet conversation, but I am also very sensitive about background music. The furniture consists of basic wooden tables and chairs providing a warm and pleasant atmosphere. On the mezzanine there is also a sofa and several arm chairs around a low table. View from the door into the restaurant. Mezzanine level is in the back. The staff is very friendly and speaks many different languages. We tried German, English, Hebrew and Russion but suspect that others would also work. 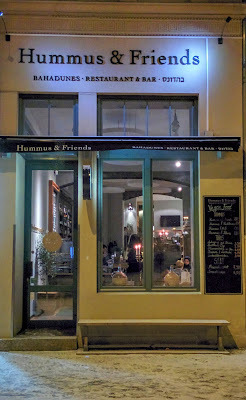 Hummus is indeed the main dish of the place, you can get it in all kind of variations. 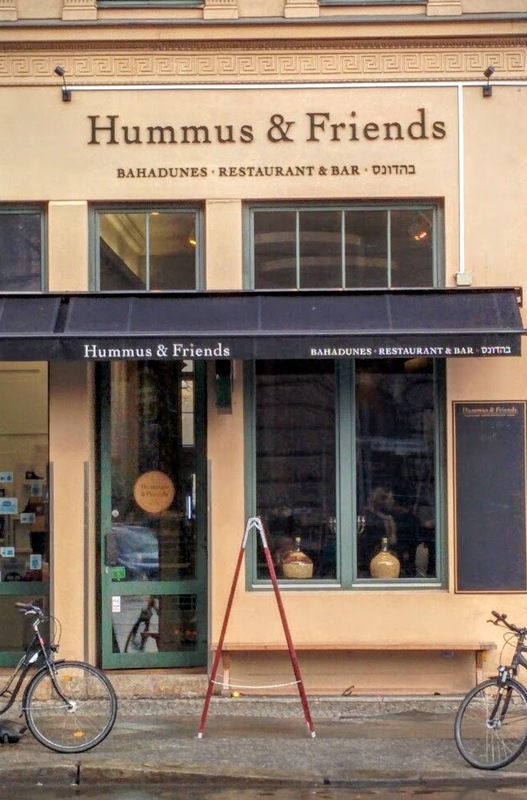 Besides hummus there are also salads and tapas on the menu as well as a different soup every day. A few dishes like cauliflower are served warm. 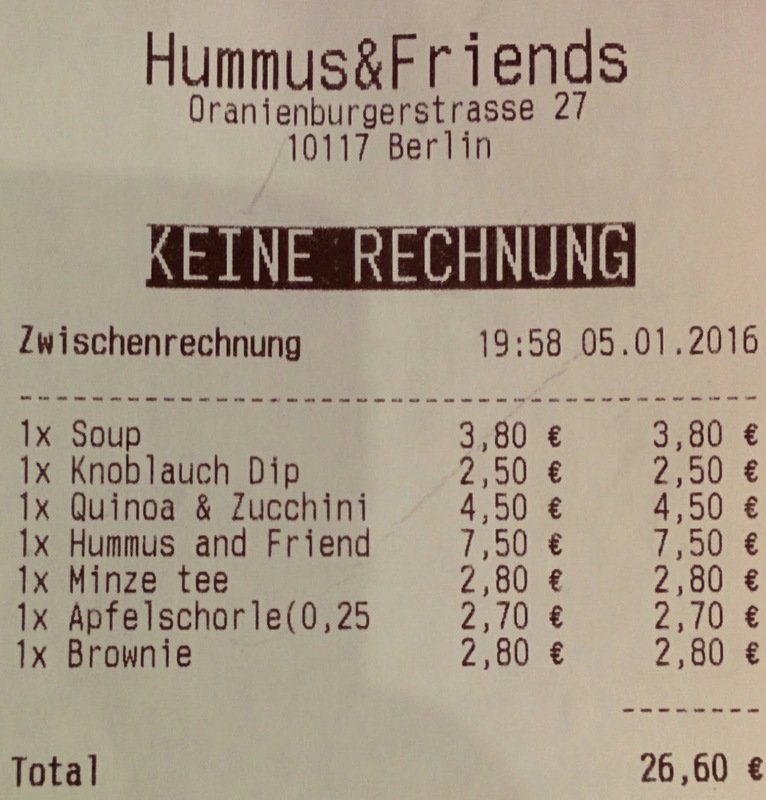 All in all the choice is smaller than in other restaurants and very much focused on Hummus. The bill was very acceptable. 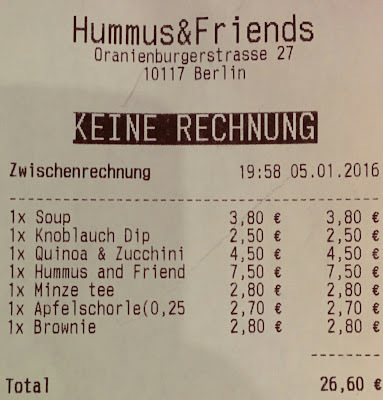 We tried the soup, quinoa & zuchini and obviously a large portion of hummus (Hummus & Friends Special) with an egg, Ful, onion, petrosilia, tahina and sauce. The hummus was amazing! If you like hummus - as we do - then just the hummus makes it worth to come. The other dishes where also very pleasant. Together with a shared soup for starters and a brownie for dessert we had a pleasant supper that left us satisfied but not heavy. The pita was freshly made, nice and fluffy. The mint tea was also very nicely done with lots of fresh mint leaves and honey. 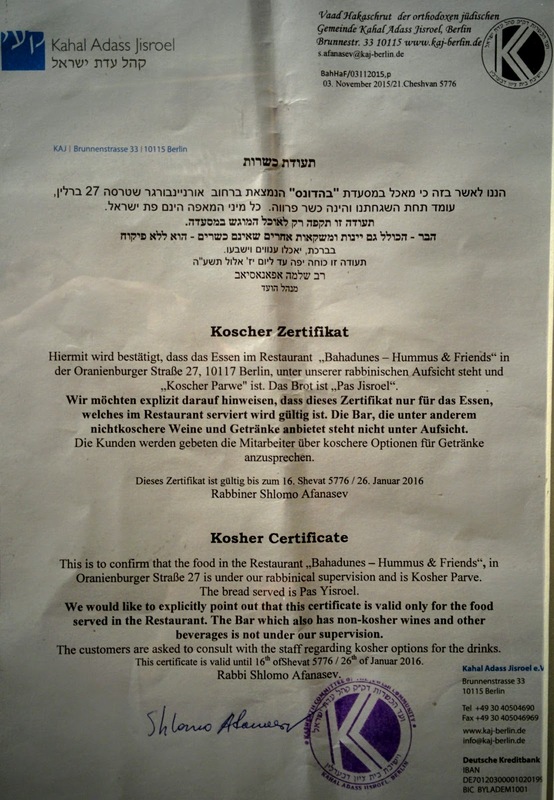 The Hebrew text explains how it can be kosher and still operate on Shabbat. 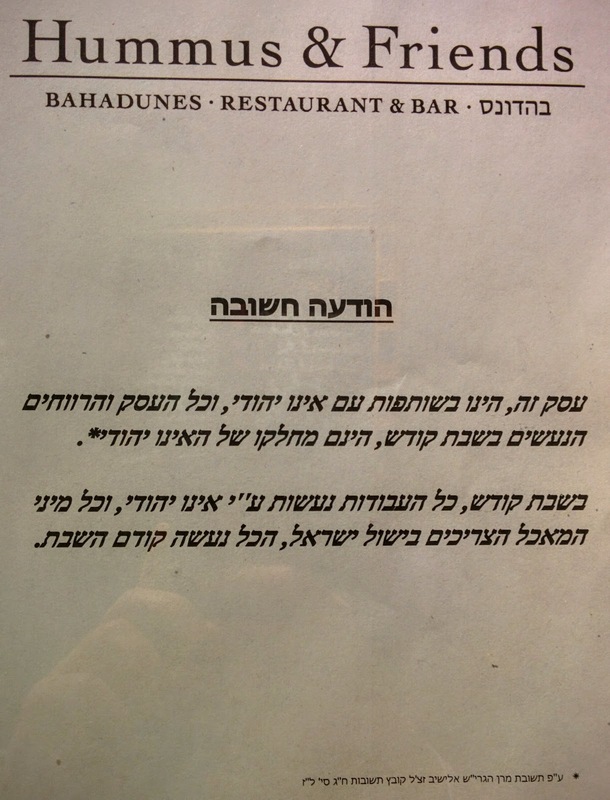 The restaurant informed me that the pita is המוציא. All in all we had a very pleasant evening and will be happy to come again. 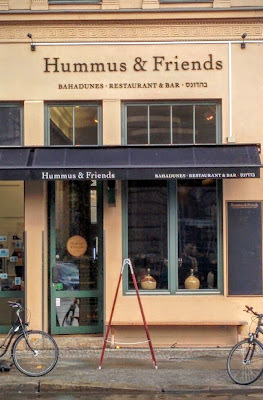 Informative post about the Restaurant Review Hummus and Friends.